If you are a horse owner and have many of your horses on free roam land, you know that people do confuse one horse for another. Startup company Anitar is working on a kickstarter project to help those with this exact problem. They are creating a sleek, small sized handheld RFID reader. 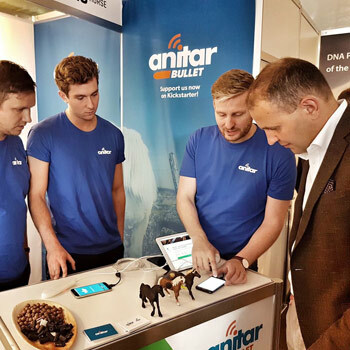 Karl Mar Larusson, Founder of Anitar, said the Anitar Bullet offered a solution for quick and easy identification of horses – or any microchipped animal – in the field. Larusson’s own experience allowed the concept to be born. He caught himself grabbing someone else’s horse by mistake. The owner of the horse was not amused. “You might be able to recognize your horse immediately, but what’s with all the other people who have day-to-day access to your horse? Breeders, trainers, farriers, caretakers, or other riders; can you be sure they pick the right horse?” Larusson says. The device bridges directly between the animal and various databases, with the WorldFengur Studbook, the international registry for Icelandic horses, the first on board. Already nearly $15,000 has been raised so far, and this week members of the Reykjavik-based startup met the president of Iceland, Guðni Th Jóhannesson, at the World Championships for Icelandic horses in Oirschot, where they demonstrated the workings of the Anitar Bullet. Larusson says that up to now, there hasn’t been a reliable, easy to use solution for in-the-field equine ID. “Most RFID animal tag readers are expensive, clunky, and require the user to run all operations manually. The Anitar Bullet is compatible with iOS and Android. The RFID technology allows for tagsto be read from a distance of up to ten centimeters, which will then automatically display in the Anitar app. Anitar needs 250 interested parties to pre-order the tag reader to make production possible.